Ted and I waited for the sun to warm things up before we hit the streams on Sunday. I picked Ted up around 10am and we set off for Millers Run Creek but we found there was a running race going on at the park. There was cars and people everywhere so we aborted and headed south down 79 to hit some holes on Dutch Fork. We hit some delayed harvest sections finding lots of fish and low pressure which was great for such a nice day. 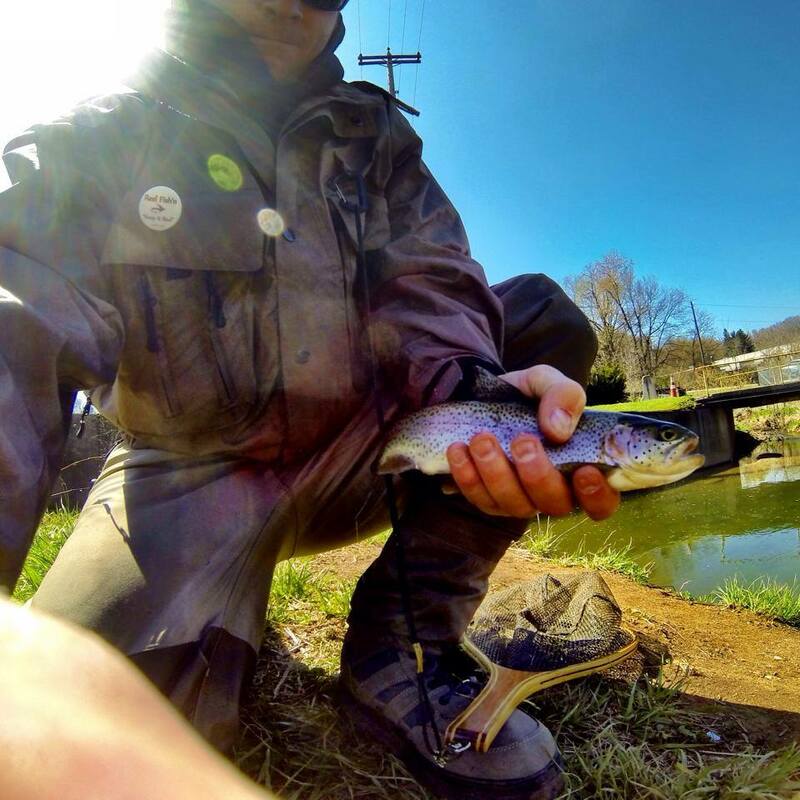 The water temps were still very cold for this time of the year so the trout were happy fish. Ted had his fly gear and did very well on Dutch Fork delayed harvest section. I did well with Trout magnets ranging from Pink, Gold and whites. Egg patterns were also working well which was great since opening day the stockies didn’t want anything to do with egg patterns. We finished our day off down at the SSC club which was the best part of the day for myself. The fish were hitting egg patterns and meal worms steadily. Ted and I both had a fair chance at a hungry palomino down at the club hole that we both lost. You could tell he was in a feeding frenzy and Ted had him hooked up on a black wolly bugger but he broke off. I late had him on a single egg but he also got away.. typical! 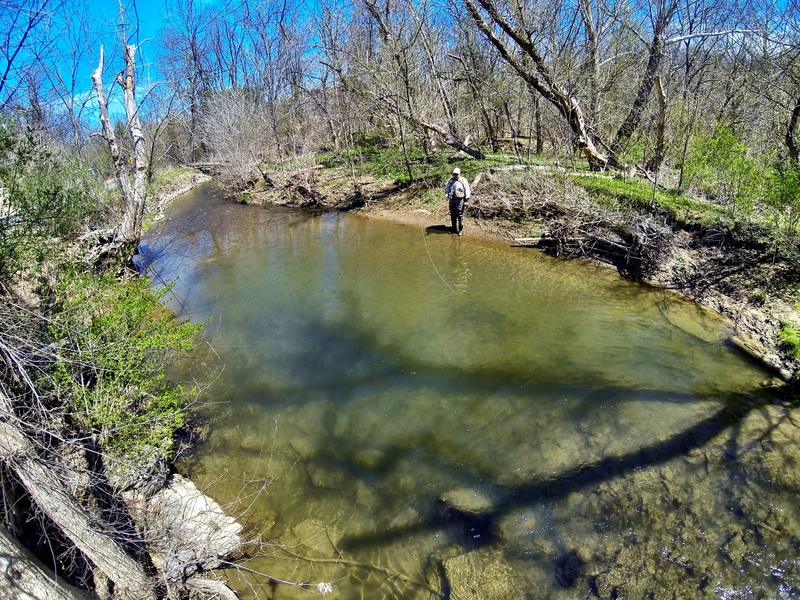 Below is Ted fishing the delayed harvest section on Dutch fork which he was crushing the stockies on stone fly pattern. We saw tons of stone flys on the stream and crawling on our gear which is a great sign for things to come on this stream. Few more weeks I should be able to get my boat out. The PFBC doesn’t have public docks in yet but I hope they do so soon. IM itching to get the boat out and target smallies. They should be spawning soon! Thanks for the great trip Ted – looking forward to the next one! can you lead to me to some good spots on dutch fork? Above the lake has been pretty good for me. Take exit off 70 and hop on route 40 – turn onto lake road. The stream all through there is good. Careful some is Delayed Harvest so you have to use artificial lures.